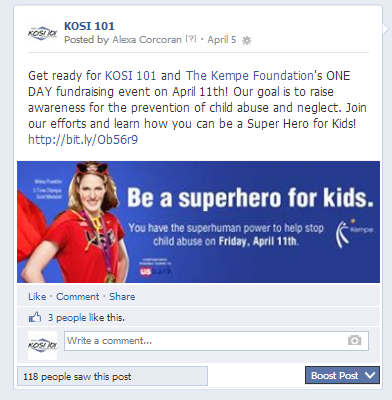 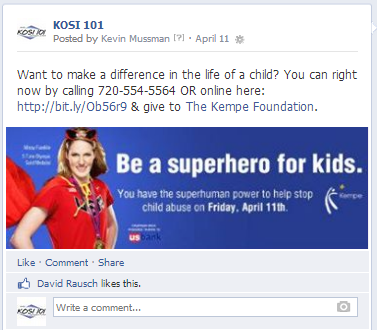 Be a superhero for kids. 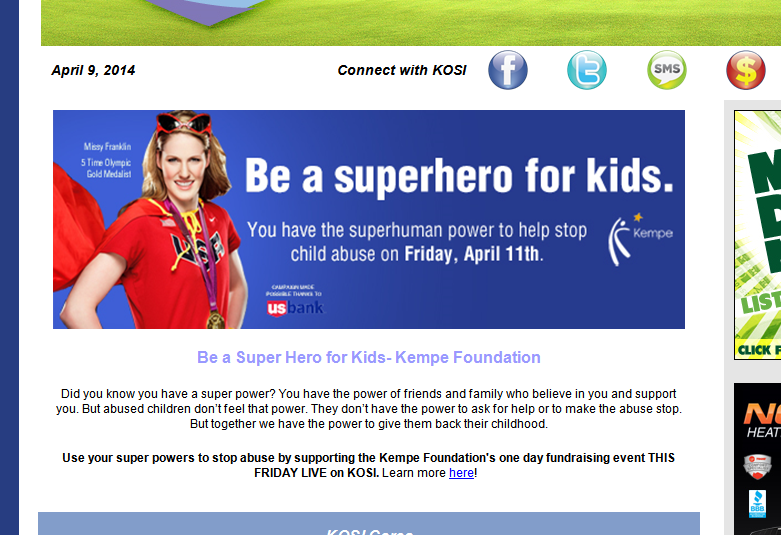 Did you know you have a super power? 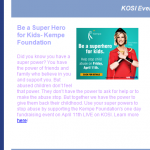 You have the power of friends and family who believe in you and support you. 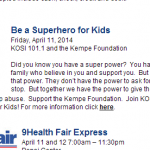 But abused children don’t feel that power. 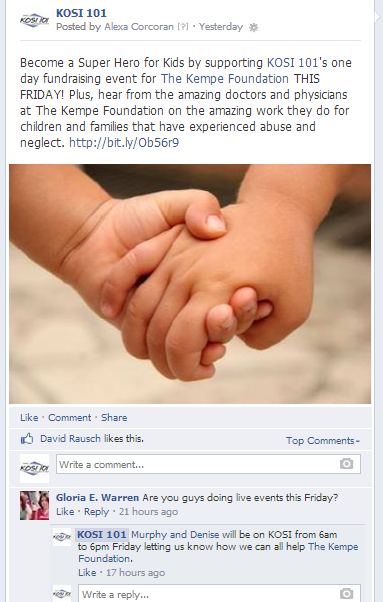 They don’t have the power to ask for help or to make the abuse stop. 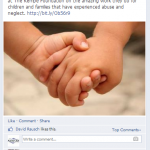 But together we have the power to give them back their childhood. 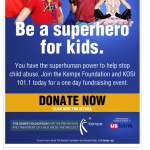 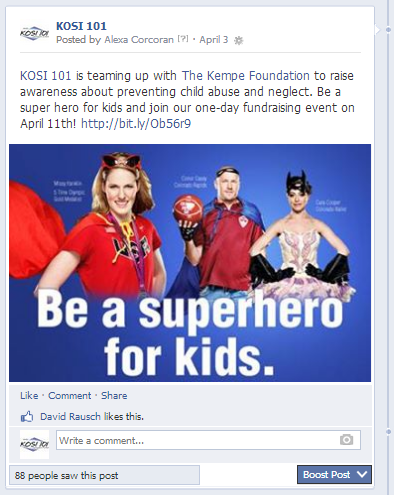 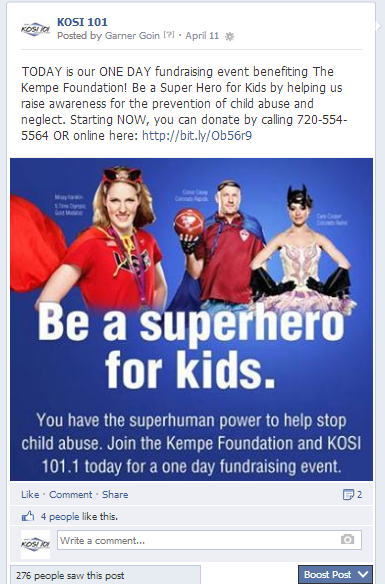 Use your super powers to stop abuse. 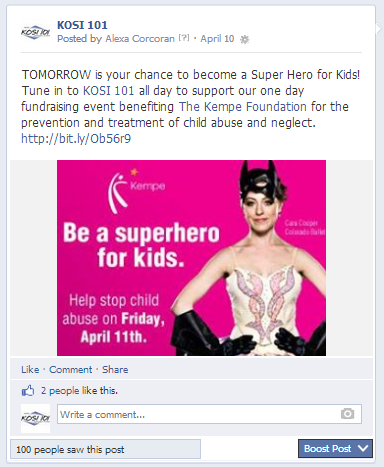 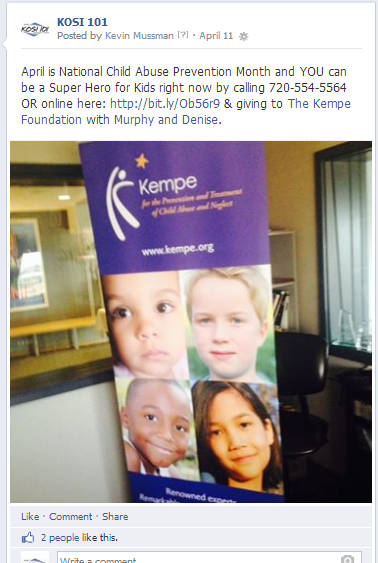 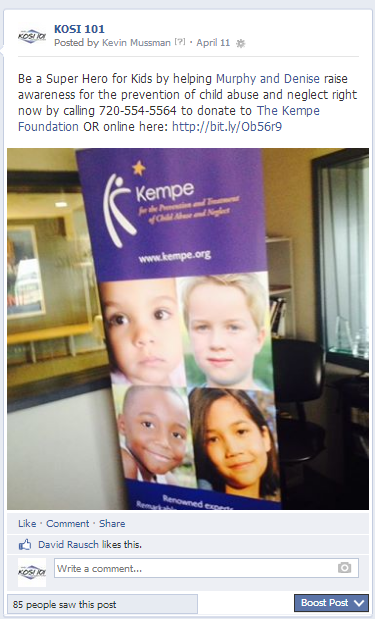 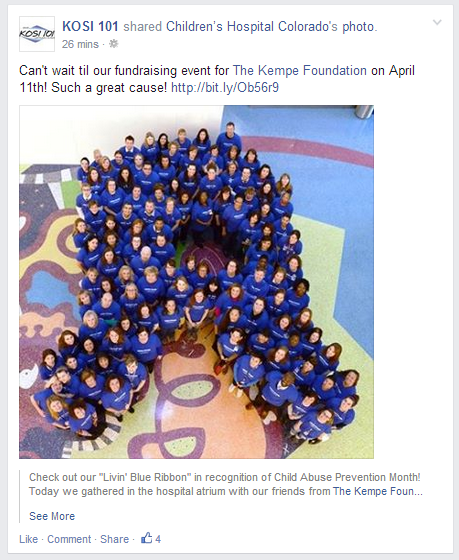 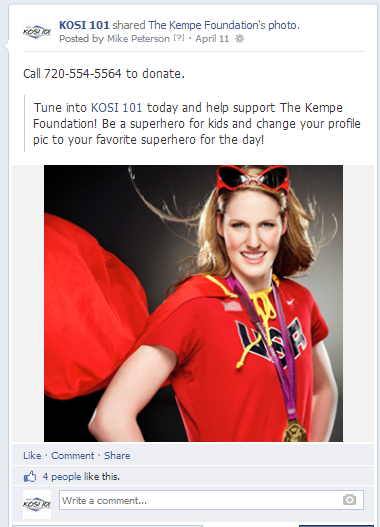 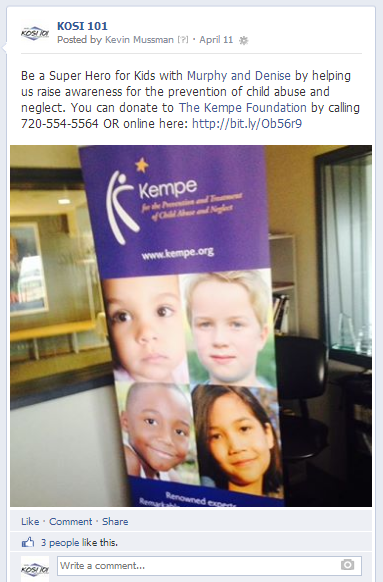 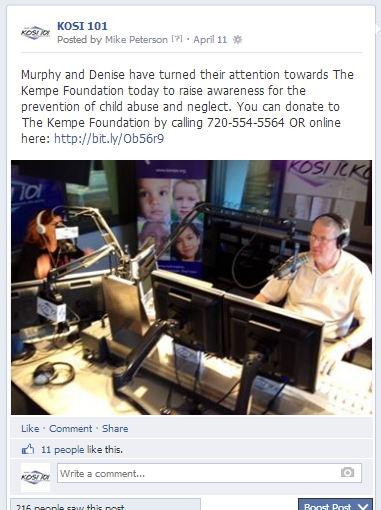 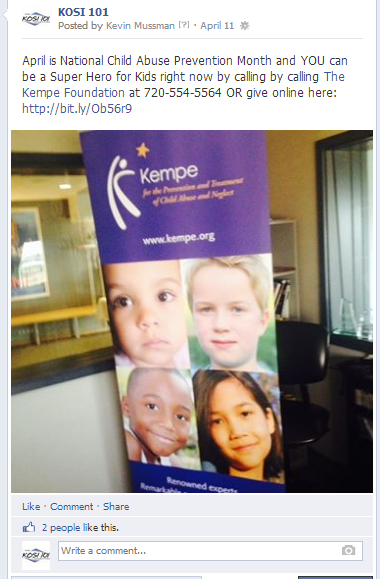 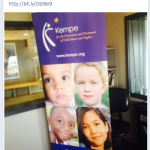 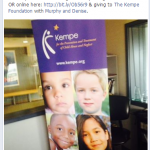 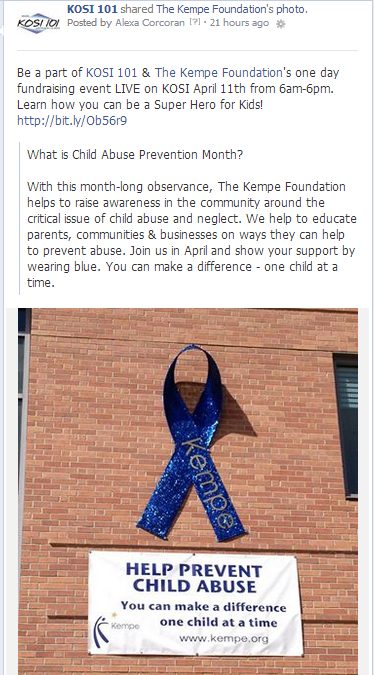 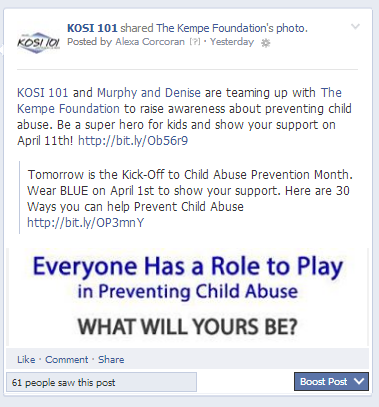 Support the Kempe Foundation. 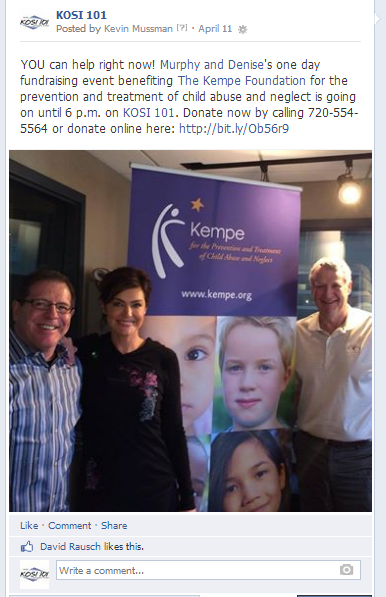 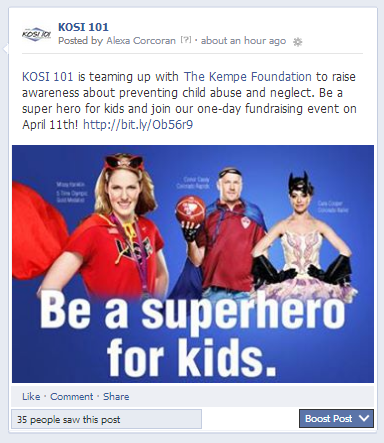 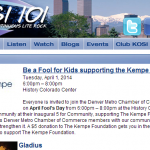 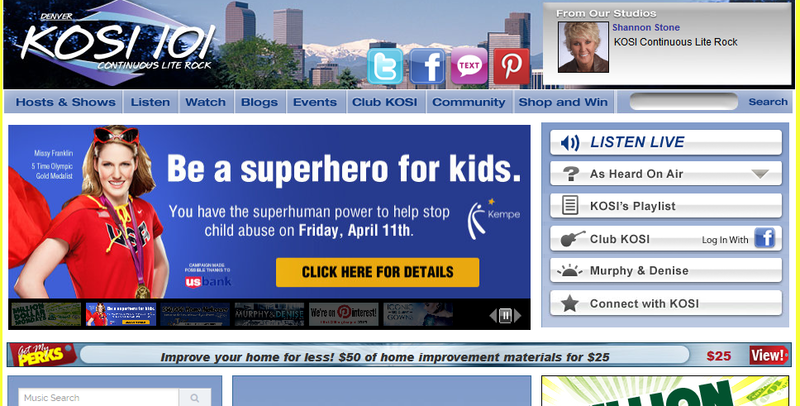 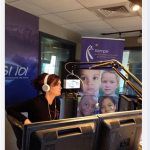 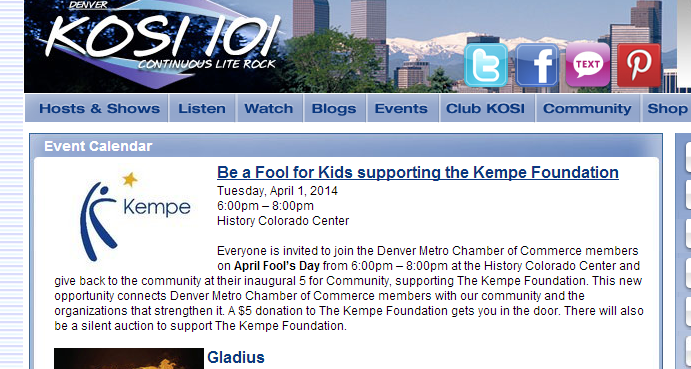 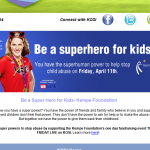 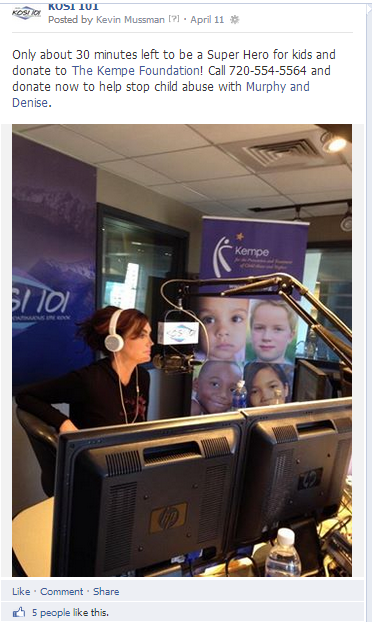 The Kempe Foundation partnered with KOSI 101.1 to bring a 1 day fundraising event to the Denver market on Friday, April 11th! 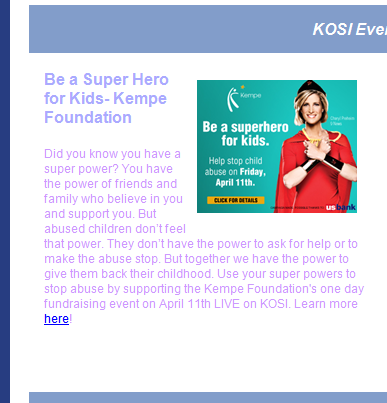 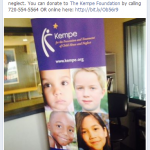 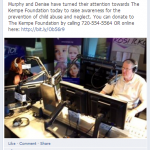 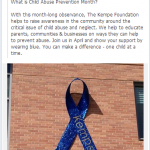 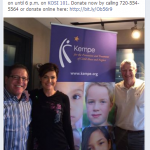 Leading up to the event, The Kempe Foundation ran a bank of vignette commercials that showcase the mission of The Kempe Foundation and made the emotional connection with the listeners while relating stories of victims of child abuse and neglect. 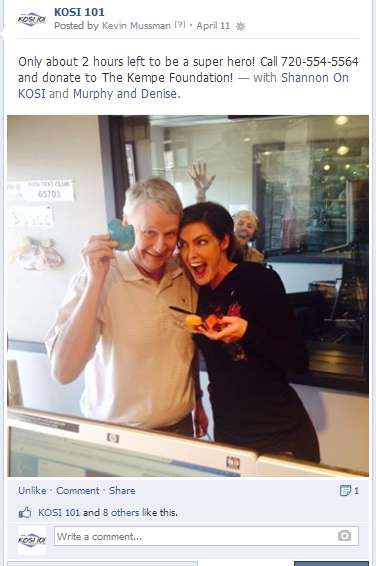 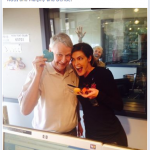 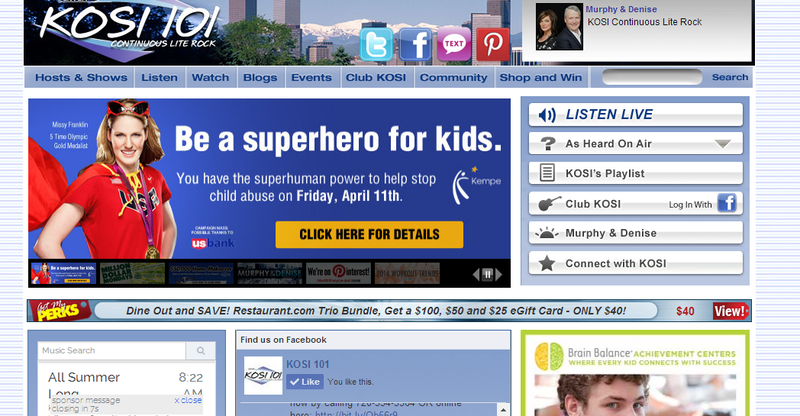 • Matching commercials (60x :60s with US Bank inclusion) on KOSI 101’s online radio station. 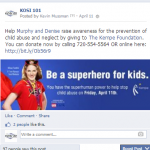 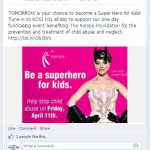 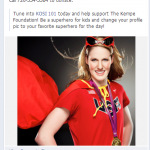 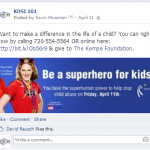 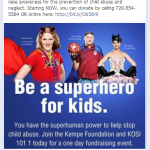 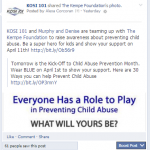 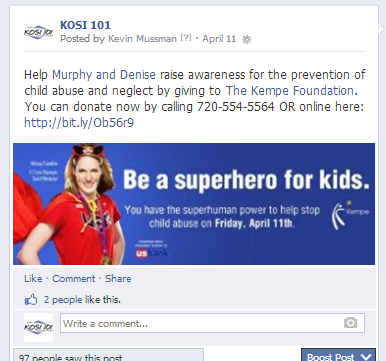 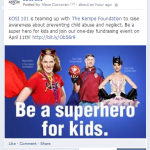 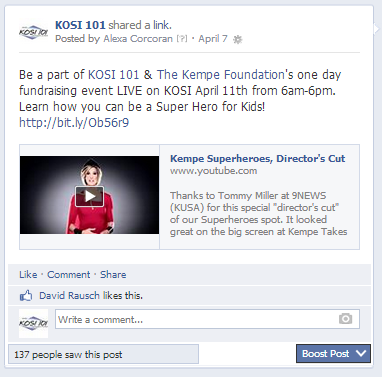 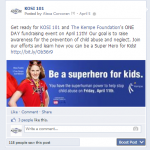 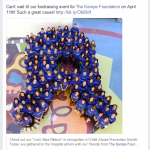 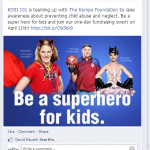 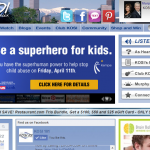 • Social Marketing with posts on how to support Be a Superhero for Kids, Radiothon and coverage of the human blue ribbon.